An old soldier was once on his way home where he meant to spend his furlough , and he was tired and hungry. He came to a village and he rapped at the door of the first hut he saw. "Let a traveller in for the night! ", he called . The door was opened by an old woman. "Come in , soldier," she said. "Have a bite of food for a hungry man, good dame?" the soldier asked. Now , the old woman had plenty of everything, but she was stingy and pretended to be very poor." Ah , me , I`ve had nothing to to eat myself today, dear heart, there is nothing in the house," she wailed. "Well , if you`ve nothing , you`ve nothing, " the soldier said. Then , noticing an axe without a handle under the bench: "If there`s nothing else , we could make porridge out of that axe." The old woman threw up her hands in astonishment . The old woman brought a pot, and the soldier washed the axe, put it in the pot, and , filling the pot with water, placed it on the fire. The old woman stared at the soldier and never taking her eyes off him. The soldier got out a spoon . He stirred the water and then tasted it ." It will soon be ready," said he . "A pity there`s no salt.". "Oh i have salt . Here take some." said the old woman. The soldier put some salt in the pot and then tried the water again . "If we could just add a handful of groats to it. " said he . The old woman brought a small bag of groats from the pantry . "Here ,add as much as you need," said she .The soldier went on with his cooking, stirring the meal from time to time and tasting it. And the old woman watched and could not move her eyes away. "Oh how tasty this porridge is!" the soldier said, trying a spoonful. "With a bit of butter there could be nothing more delicious ." The old woman brought some butter, and they added it to the porridge. 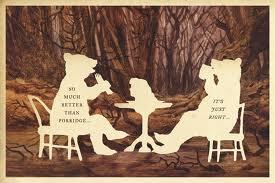 "I never thought that axe porridge could taste so good!" the old woman marvelled . "And the soldier ate, laughing up his sleeve, all the while".